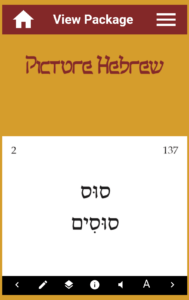 One of the unique features of the Picture Hebrew Flashcards app is the pile system. Most flashcard apps use a learning-algorithm review system, which can make the user passive in the learning process. Our pile system enables self-evaluation, a key component of effective learning. We assume all of our users are mature learners who are able to take full ownership of the learning process. Part of that ownership is to self-evaluate your knowledge at each stage. Is the card known or unknown? And do the known cards require daily, weekly, or bi-weekly review? The motivated student will learn faster and retain knowledge longer through self-evaluation. 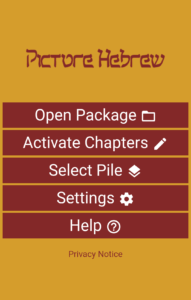 When you download the app and import the package, only the first chapter of five cards is automatically activated. 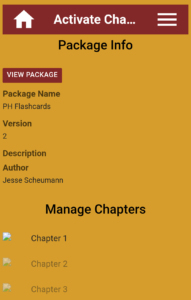 To activate new flashcards, click the “Activate Chapters” tab on the home screen. Then scroll down and select whichever greyed-out chapter you want to activate. Any newly activated chapter will be imported into your “New” pile. Most chapters consist of fifteen flashcards. 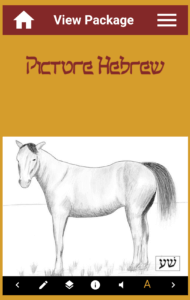 The default flashcard package is ordered according to the Graded Reader’s Hebrew Stories (coming 2019). However, we can make custom packages keyed to the order of any frequency-based vocabulary list upon request. 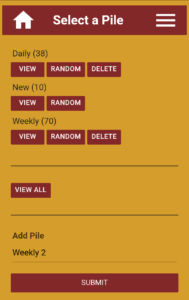 There are three default piles on the app. A newly activated chapter is imported into the “New” pile, because these are cards you haven’t learned yet. In your “New” pile, I recommend you start learning the cards “backwards.” To do so, click “Settings” on the home screen. 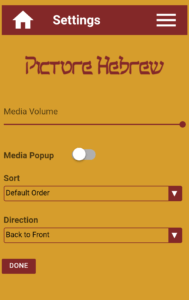 Once there, select the “Direction” to be “Back to Front.” Then all the cards will default with the Hebrew word as the “front,” and the picture as the “back.” If you are unsure of what a word means, click the “Information” (i) button to make sure you notice exactly what we tried to illustrate with each picture. Use the audio feature liberally as you toggle between the back and front of the card. Try to associate the oral and written word with the picture. Once you got it, move to the next card. Learn it, and try to guess both cards correctly before moving on. Continue until you can go through all the cards in the pile without getting one wrong, pronouncing the Hebrew out loud and trying to picture the front before flipping the card. Once you can get through the whole pile without making a mistake, take a break. Or, if at anytime you feel yourself stuck and getting frustrated, put the phone down. After a few hours or a night of sleep, you will be energized and will have more success in learning. Optimally, you can go through the “New” pile in the morning and again in the evening each day. When you can go through the pile once without getting one wrong, push yourself the next time to go through the pile twice without an error. Randomize the pile between viewings. 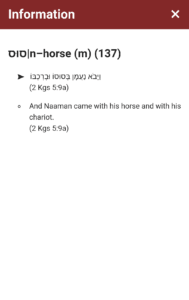 Once you think you have mastered “Back to Front,” switch the default “Direction” to go “Front to Back.” It is harder to produce the language by seeing a picture and saying the Hebrew word(s). But if you can do so, you have internalized the language. Once you think you have any one of the cards in the “New” pile learned, you can move it to a different pile. While viewing the card, click the “Pile” button (outlined below). The filled-in oval indicates which pile the card is currently in. Click the “Daily” oval to move the card. The pop-up window will automatically close, and the card will move from the “New” pile to the “Daily” pile. Once you learn the first eight chapters, you will have over 100 cards divvied up in your piles. What is the optimal distribution of such a large set of flashcards? As a general rule, I work towards emptying my “New” pile, keeping my “Daily” pile capped at 30–45 cards I know well, and placing the remaining mastered cards in the “Weekly” pile. 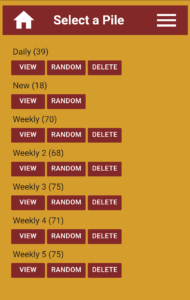 So with around 100 active cards, my goal would be to have about 70 in the weekly pile. But this starts to become a big pile. I suggest capping the weekly piles at 50–75 cards each. 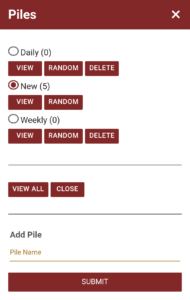 You can add new piles at the bottom of the “Piles” page by typing in something like “Weekly 2” and pressing “Submit.” When you have hundreds of flashcards active, you will want to have multiple weekly piles, and you should review each of them on a different day of the week. This way, you review no more than two piles (and no more than 100 cards) on any given day, even if you have all 400+ cards in working memory. The idea behind the pile system is to spend only as much time as needed on each card in order to master it. The danger with this mindset is letting any cards slip through the cracks. Because this danger is real, I recommend moving a card back a pile whenever you get it wrong. If you guess a card wrong in a “Weekly” pile, move it to “Daily”; if you guess wrong in “Daily,” move it to “New.” And don’t make any excuses (e.g. “I wasn’t paying attention” “I drew a blank”). Be hard on yourself. Whenever you guess wrong, move that card back a pile. Conversely, don’t be afraid to move a card up a pile. In order to transfer memory from short-term to long-term, you need increasingly longer breaks between exposure. Push yourself, and if you can’t remember it after a day or a week, then you move it back a pile. Similarly, when you feel you have cards completely mastered, create a “Bi-weekly” pile. If you have any other tips or tricks with the pile system, leave a comment for others below.